The Tahoe Regional Planning Agency (TRPA) is charged with preserving the water quality and clarity of Lake Tahoe for future generations. There are many ways in which TRPA discharges this duty; one of those ways is through the Best Management Practices (BMPs) Retrofit Program. This program represents the primary contribution from the private sector towards improving the water quality of the Lake and sets forth various requirements which individual property owners and public entities are obligated to comply. R.O. 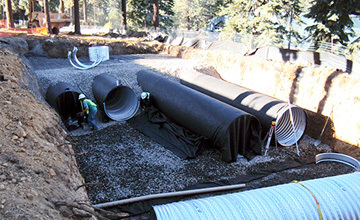 Anderson has significant experience in the design, permitting and oversight of constructing BMP improvements within the Lake Tahoe Basin. In a broad sense, BMPs provide for the collection of stormwater run-off from impervious areas and treat the run-off prior to discharge to downstream points. They also serve to limit erosion of bare soils which are a source of fine sediment particles that contribute to degradation of water clarity. Another BMP that is typically considered is the operational practices of a facility. For example, the amount of road abrasive applied to a parking lot in the winter to prevent slipping and how the abrasive is cleaned up in the spring impacts the clarity of the Lake. 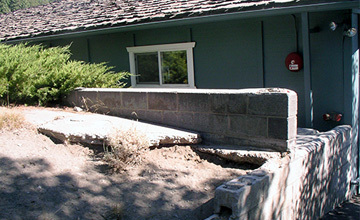 These BMPs all serve to improve the quality of stormwater run-off before it reaches Lake Tahoe or other surface waters. Many commercial and multi-family type of properties have already complied with their BMP requirements. If a commercial or multi-family property requires a certification, the odds are good that a professional engineer will be needed to provide a stamped set of drawings for the BMP design. 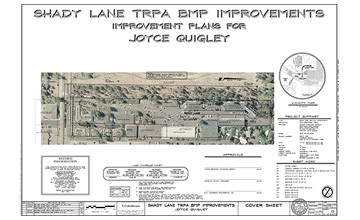 Tahoe Regional Planning Agency (TRPA) issued an order to the commercial property Owner requiring that their nine acre site comply with TRPA’s BMP regulations. Since the site had little available space to design an above ground retention system, the Owner turned to us for assistance with the design, permitting and construction management of the project. The project was also complicated by several factors including working adjacent to a Nevada Department of Transportation highway and the number and location of existing trees and utilities. The Shady Lane project included nine acres of mainly industrial use (highly impervious) on 15 separate parcels.